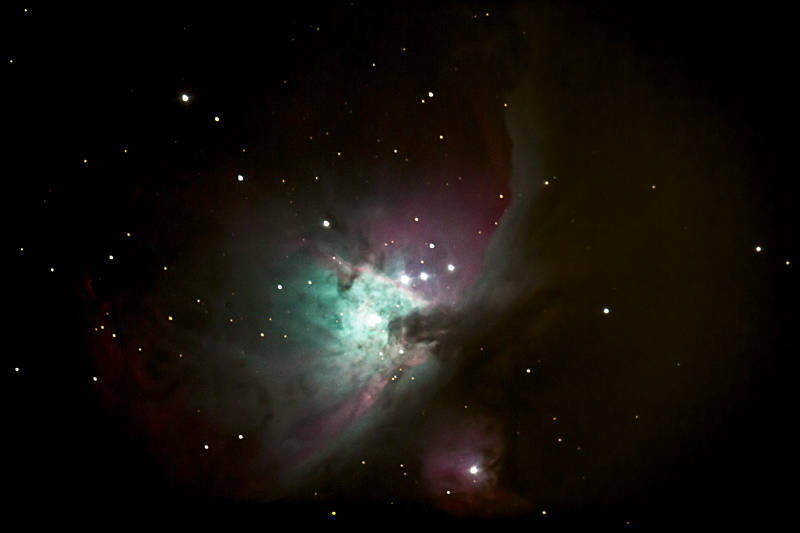 This is the Orion Nebula also known as Messier 42. To the naked eye it appears to be the middle star in Orion’s sword. We were lucky enough to see it at the Warrumbungle Observatory where you could attach your DSLR to the telescope. I say lucky because this is the second time we have visited this area and the clouds seem to follow us each time. Our host Peter Starr did his best to point the telescopes at various features between the clouds. We are on our way to visit the Barrick Gold Mine in New South Wales and hope to be in Sydney by Friday in time for Karen to fly back to UK. Brilliant picture. Is that the whole image or is it clipped? Is that the colour the camera “saw”? The colour depends on which star you use for you white point. When you shoot in RAW it is not specified when you take the picture. The camera does detect more colour than the human eye as we see most stars as black and white so colour becomes a subjective choice. I have removed crop on this image for you. That is a very good image, easily as good as published ones of the Orion Nebula. It’s handy to have a nice big motorised telescope to do the light gathering. What was the aperture of the scope? Focal length was 3.5 metres, Not sure about the aperture but the whole telescope was about the size of an arm chair in its own white dome. He had about 5 mini observatories in his front garden, the rest were remotely owned and operated and occasionally burst into life as a result of an internet signal.